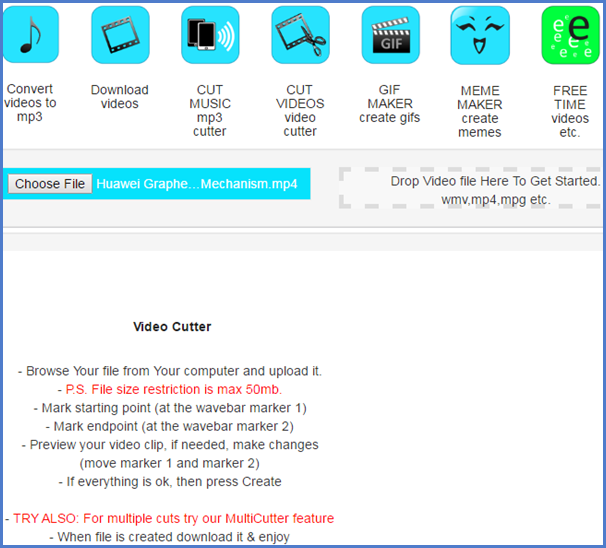 When talking about cutting a video, usually you will install a desktop video cutter software, like Gihosoft Free Video Cutter or the article I wrote before: Best Video Cutter Free for PC. But if your computer space is almost running out of, why not just use an online video cutter to directly cut videos online without the bother of any other software. Apart from trimming local videos, with an online tool, you can also cut YouTube videos online directly. This article lists 10 best online video cutter, some of them have the features to cut local videos, some of them are able to cut and download YouTube videos online directly, just read it through to find the best one you like. 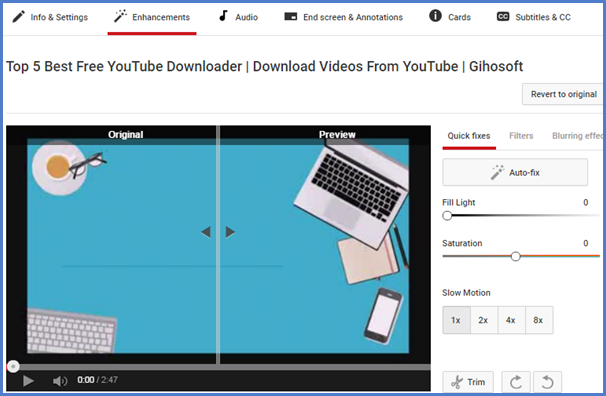 If you want to download YouTube videos online, then online YouTube downloader can help you. But if you want to cut videos online, you can turn to Online Video Cutter. It’s a popular online video trimmer site, you can use it to cut videos smoothly without any difficulty no matter if you are a novice or a guru. Apart from cutting videos, it also plays an important role in cropping videos, rotating videos & editing videos etc. The online rotating feature gives you the ability to rotate your own local videos 90, 180 or 270 degrees. The online cropping feature allows you to cull desired area of a video and change frame proportions at the same time. All these practical functions are integrated in one place, definitely make it an all-in-one popular site. With this all-round site in hand, it’s super easy to trim videos from computer or Google Drive. And I bet that once you use it, you will never want to waste your time and energy to try other similar software. An all-in-one site that you can use it to crop, rotate, edit and trim videos online. Security is guaranteed, the file you upload will be deleted within a few hours after you finish your work. Video Toolbox is also a professional online video cutter and cropper site. As its name suggests, it can do a multitude of things including but not limited to cutting, cropping, and editing videos. The online cutting features allow you to cut videos at any point you determine, and you can also use it to extract audio, video or subtitle text from a file. The best advantage of this site is that you can directly upload a video from online video sites it supports, including YouTube, Vimeo and Tube8 etc. With this wonderful function you can easily cut videos from YouTube online directly with the URL, avoid wasting a lot of time loading local videos. A comprehensive video tool allows users to cut, crop, edit, join, convert and add watermark. Why searching on the web for a best video cutter online? YouTube Video Editor just can complete this video trimming work online perfectly. When you upload a video on YouTube, click “Edit” and it jumps to the edit interface. Click on the second column “Enhancements” – next to “Info & Settings”, you will see the “Trimming” button lies on the bottom. The “Enhancements” section has many practical features, aside from trimming videos online, it also allows users to adjust the hue of frame, like Fill Light, Saturation & Color Temperature, and add filters as well. Trimming YouTube videos online is only a small amount of capabilities that this powerful video editor tool has, you can also be free to add soundtrack & subtitle etc. Next time when you upload a video to YouTube, don’t forget to trim, crop and edit YouTube videos with it. An integrated site providing frame enhancement, audio and video editor function. Professional yet easy to learn. Wincreator.com is an online video trimmer site for video & music cutting, gif making, meme making, downloading & converting YouTube videos to MP3 online etc. As for cutting local videos & musics online, it’s very simple to handle. You just need a few easy steps to finish it: browser your file and load it, mark start point and end point, preview and save the video. When you preview, you can make some changes if you are not satisfying with it. If you have a series of videos & musics need cutting, then you can try the MultiCutter feature of this site. The weakness of this product I think is the file restriction, it can only support video files less than 50MB. Video cutting, MP3 conversion, video downloading can all be done here. 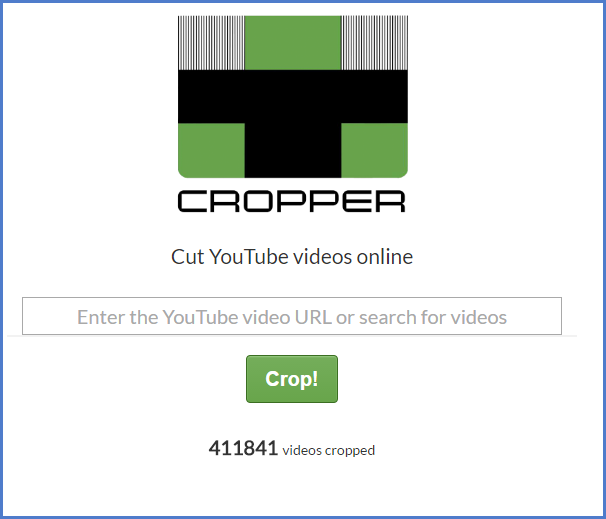 YtCropper is an video cropper online site, it’s a best site for those who only want to get a specific point of an online YouTube video. To cut YouTube video online with this tool, first you need to copy the UR of a YouTube video, or you can copy the video’s specific ID instead. Then you paste this content into the targeted box, mark the staring point and ending point, then hit the “Crop” button. After that, you will see the words “Video properties” on the interface, which contains direct link and embed code information. You can use the direct link to spread this video to all the world by social media apps or emails, and the embed code is used to embed the video into your website. As we can see, the main advantage of this online video site is that it provides a simple way to cut YouTube video online and get a specific range, without the bother to download the full video and cut it from desktop. Brief interface and simple operation. Note: When using online video cutters to cut local videos, you’d better upload it before cutting, which may cost you some time (that’s the defect can’t be fixed). ClipChamp is a complete video editing tool which comes with many excellent features. You can use this tool for video trimming as well and remove all the unwanted parts from the video precisely. This tool also helps users to split and combine videos, flip and crop them, and take the mirror image. With this online video editor site in hand ,one can easily save the edited video in high-quality video and audio. Besides, you can also edit your webcam recording or any other video using this tool. 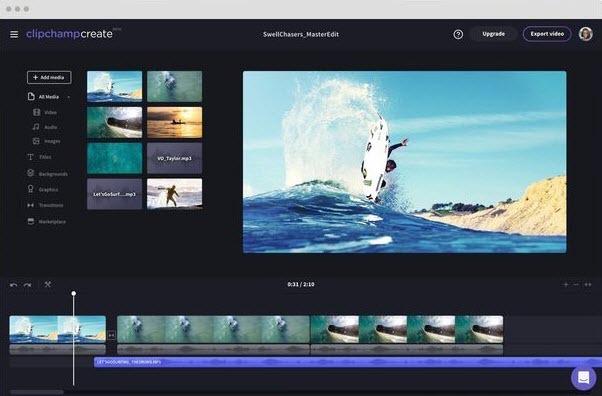 Because of its high compatibility and flexibility, millions of users from all around the world are using this online tool for video editing and trimming. Before using it, make sure to update your Google Chrome browser to the latest. It is a versatile tool which can be used for both editing and trimming. It’s secure to use and allows users to make a change automatically and undo it in a single click. It is available in more than 100 countries of the world for free. It allows users to easily export the video through Gmail, Facebook, Twitter, Instagram, Dropbox and other social media and drive platforms. You can easily customize the color, saturation, intensity, volume, texture and other parameters of the video. 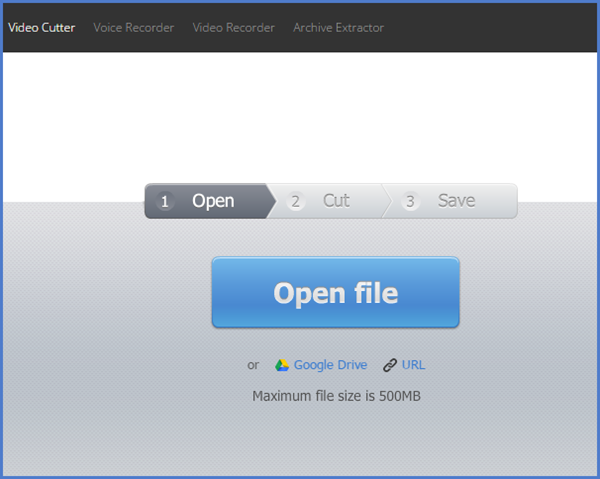 AConvert is a well-designed video cutter and trimmer online tool which you can operate online for free. Go to its official site using any of your browsers and get started with it without any hassle. Apart from cutting the videos, you can also use this tool to convert, merge, rotate, crop and pad the video. To cut the video, first go to the cut tab and then select the video file which you want to cut. Then, input the start position and duration, for example, 00:05:35. After that, click on “Submit” button to start the cutting process. This online video trimmer will automatically retry another server if one failed, and the output files will be listed in the “Conversion Results” section. Besides, this online video tool allows you to scan the QR code to transfer the cut videos to your mobile devices, you can also save the video content to online storage services such as Google Drive or Dropbox. Easy-to-use interface with simple instruction to use the tool. There is no quality loss, as there is no encoding & decoding involved in the trimming process. Kizoa is a versatile platform which can be used to create and edit the videos easily. You can also trim your video online and cut its extra and unwanted parts. For cutting the video, first of all, select the video which you want to cut. You will then get an option to select the desired part of the video using the dragging option at the time-bar of the video. You can take a preview of the selected video part by clicking on the play icon on the video. You can also redo and undo the changes made by using the option given in the top left and right side of the video. Once you have selected the desired part of the video clip, start the trimming process by selecting the “Cut the clip” option. In this way, you will get your trimmed video in the same quality as the original video. It’s compatible with all the PCs and the iPhone. It gives a platform where you can display video editing talent and have access to many tools for editing videos. A versatile online video tool which allows the usage of photo, video, music, text, special effect and transition. Cellsea is an online video editor site which is capable to fulfill all the trimming needs of the user. It’s very simple to use, anyone can master it in a few minutes. It does not let the video lose its quality because of the trimming. To use this tool for online video cut work, first you need to import the video to be trimmed using drag and drop option. After selecting the video, you can make some basic change to the video by cropping, resizing and trimming it. This tool is capable to edit or convert the video online. It has a very simple interface so you can easily trim or cut your video without any hassle. You can add any external audio to the edited video as well. You will find your edited video saved securely on its page. Shotclip is one of the simplest online video editor tool, it allows the user to edit targeted video and share it with the world. No matter who you are, either a newbie or an expert, you can easily use this video editor tool without any hassle. You will be able to use this Shotclip for your Android phone as well in future. To use this site, all you need to do is to upload the video on its site and edit the video by adjusting its saturation, contrast, color, intensity and others. You can also rotate, trim, crop, flip and take the mirror image of the video. It also allows the user to split and combine the video. Once you have made all the editing changes of the video, you can save it to your device. Easy to edit & trim your videos online with ease. Highly compatible with browsers like Opera, Chrome, Internet Explorer, Firefox and Safari. You can preview and monitor the changes in the video before saving. It allows the user to undo the changes as well. As I’ve showed you 10 best online video cutter for you to cut videos imported from computer or directly cut online YouTube videos without downloading first. Now let’s come to next step – how to use them. As these top 10 sites work in the same way, so I will take Online Video Cutter as an example reveal you the usage of these sites. Click the “Open file”button to import video files from computer to the site, then wait until the loading process is finished. Choose the staring point and ending point of the cutting range, then click to starting the cutting process. 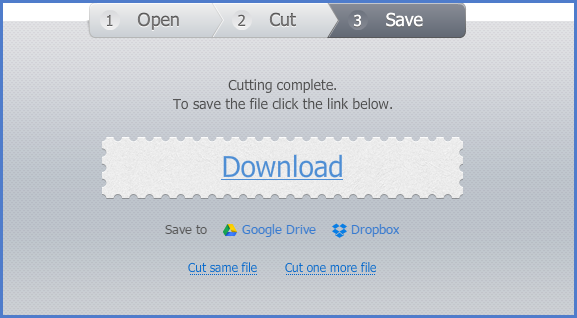 When the cutting course is finished, just click the “Download”button to save the videos to your computer, Google Drive or Dropbox. When you read through this article, you must have know the basic information about all these best online video cutter. So I hope you got the answer of how to cut videos online. And also if you are using any other site then let us know in the comment box.